The headstand is a major pose in yoga. It is necessary to build the muscles in the spine and neck before attempting this pose. For a good headstand one must understand the art of simply standing. See the fundamentals of standing yoga poses. 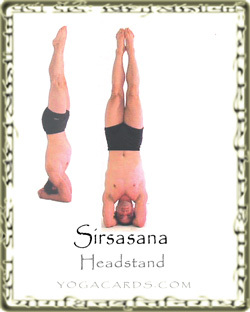 The Headstand can be entered from a number of different poses. Some of the easiest are The Child Pose, Cat Tilt and Downward Dog. Place the Top of the head on the mat and the back of the head against the clasped fingers. Straighten the legs raising the tailbone upwards. Walk the legs forward and bend the knees into the chest. Lean the tailbone beyond the shoulders and the legs will rise without much effort. This however may strain the neck so be aware. The hands and arms can be used in a number of different ways to support this pose. Another good way to do the headstand is to place the palms on the mat. Place the top of the head on front of them making a perfect triangle with the position of the hands and the head. The elbows are off the mat and arms bent at 90 degree angles. Walk the legs forward letting the tailbone pass the vertical alignment of the shoulders and bend or keep the legs straight as you rise. You may want the legs parallel. To achieve this an internal rotation is applied to both legs. In the pictures shown opposite the legs are slightly rotated out. This allows the heels to touch and also creates a better lock called Mula Bandha. This occurs when all the pelvic muscles tighten inward. This is a high risk pose. There is a risk scale that teachers use before integrating a pose into a sequence. It is simple, “Do the risks outweigh the benefits or do the benefits outweigh the risks. In teaching you are not only trying to protect your students you are also trying to protect yourself. Know your students and their abilities. Build up their spine strength in back bends especially the ones where the head is also used. (Matsyasana Matsyasana Bridge On The head Setu Bandha Sirsasana ). This will build good core spine strength and essential neck muscles that will protect the neck in the headstand.